The Schnauzer has a sophisticated and dignified look that has inspired many owners to choose names of successful businessmen and women. Gates, Jobs, and Crowly are few men that have made their mark on the business world. Names from powerful women include Irene, Ginni, and Meg. Perhaps the refined appearance comes from the breed’s characteristic facial hair. Schnauzer is actually derived from the German word for mustache. Names borrowed from owners of famous mustaches include Flanders, Burt, Mario, and Selleck. 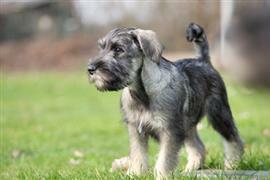 The Schnauzer comes from Germany as do many common names. Hans, Klaus, and Heidi are a just a few of the more prominent choices. Having trouble finding a name nearby is not a problem. The galaxy is more than willing to lend names like Pluto, Saturn, and Venus. Austin Power fans can take pride in a choice such as Basil, Felicity, Nigel, and Frau. Some of our pages will contain a subcategory. A subcategory is a slightly more specific grouping than the main topic of the page. For a subcategory, we will include a separated table of names and corresponding descriptions. An example of a subcategory of Red Dog Names would be 'Dog Names Inspired by Red Wines'. If you have any subcategory ideas for the Schnauzer Names page, we would love to hear them. Use the form below to submit your ideas.